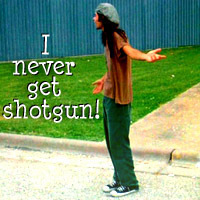 I never get shotgun!. Original প্রতিমূর্তি belong to Universal Pictures, প্রতীকী দ্বারা DarkSarcasm.. Images in the Dazed and Confused club tagged: dazed and confused image icon ron slater rory cochrane shotgun. This Dazed and Confused icon might contain ব্যবসা উপযোগী.